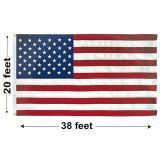 Polyester Outdoor US Flags are made from durable 2 Ply Polyester heavy fabric dyed with Dupont color-fast, UV Resistant dyes to give them brighter, fade resistant colors. Choose Polyester flags when you're located in a medium to high wind area or experiences frequent high gusts of wind. Our aim is for you to purchase the correct fabric for your application. The balance is between the product life longevity, it's flyability, and its cost. A higher price does not necessarily equate to the best product for you! If you don't have heavy wind then a polyester flag will hang on your flagpole like a wet blanket, causing rot, in the case of light wind, choose our non-absorbent Nylon Outdoor flags. Since you are here shopping for a U.S. flag, you would probably agree there is nothing more impressive than a American Flag flying. It's a source of pride and unity. Purchase the right fabric and you and the many other people who see Old Glory flying will notice everyday they drive by it. We are here to help you make the decision as to the right U.S. flag for you not the most expensive one. Shop from our collection of Polyester Outdoor US Flags. 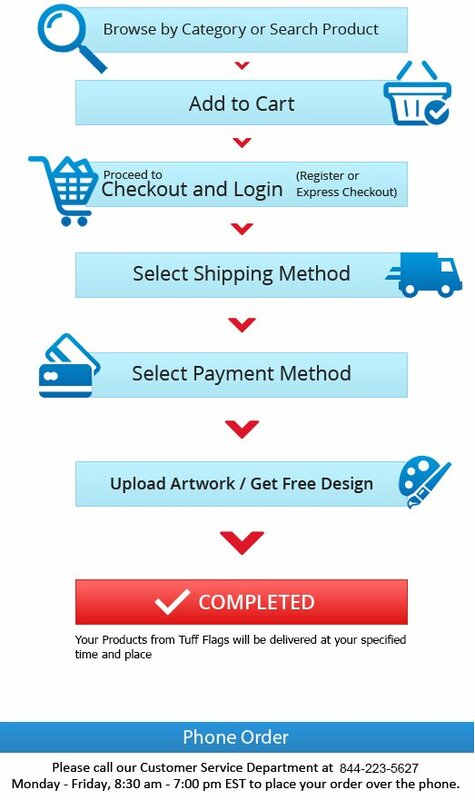 You'll find our prices are the best on the web, you'll receive quick shipping, guarantees, and the occassional surprise! 100% customer satisfaction guaranteed! 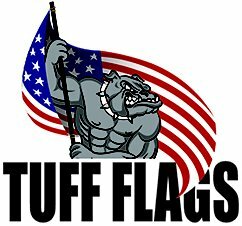 Promote national pride and unity with these 100% made in America by Americans, Polyester Outdoor US Flags from Tuff Flags. It makes a great choice for extreme outdoor weather conditions or high wind areas. These commercial grade flags are made durably and are constructed to be tatter resistant in high wind areas. Available in various sizes from 3’ x 5’ to the massive 30'x60' U.S., our Polyester Outdoor Flags are great for all types of occasions and events with one thing in common, weather conditions on the harsher side. Browse our collection of Polyester Outdoor US Flags at Tuff Flags and choose the size that matches your needs. Should you need any suggestions or tips, call us at (888) 287-3524 or email us at customercare@tuffflags.com.